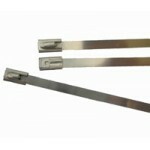 STAINLESS STEEL CABLE TIES. Buy quality Auto and Marine Electric Parts and Accessories online, Sydney. Locking Ball type- won't come undone! CTSS-150-4 Stainless Steel Cable Tie150mm x 4.6mm 304 GradeRolling ball locks cable tie into placeS..
CTSS-200-4 Stainless Steel Cable Tie200mm x 4.6mm 304 GradeRolling ball locks cable tie into placeS..
CTSS-200-8C Stainless Steel Cable Tie200mm x 8mm 304 Grade HEAVY DUTYRolling ball locks cable tie i..
CTSS-300-4C Stainless Steel Cable Tie300mm x 4.6mm 304 GradeRolling ball locks cable tie into place..
CTSS-300-8C Stainless Steel Cable Tie300mm x 8mm 304 Grade HEAVY DUTYRolling ball locks cable tie i..